Time of the cruxifiction and death? Thank God for that, it took me long enough! No, that would be too simple. :) the mere shroud and cross would be enough to remind of it. Clocks suggest sth deeper. We don`t shoot at birds, but bottles and jars are blasted into pieces one after another. Unless they're to represent the time between death and resurrection, I have no idea :( But that is too simple. You know it but in the back of your mind.You are too shy, come on, you worry that what you say will be too deep. Don`t. Double hint: Every year there is a different display. Also, remember who made this display. Every year there is a different display. Also, remember who made this display. Now I'm more confused than ever! Different display because Easter Sunday date varies? Church members made it? This riddle is horrendous!!!!! Now I'm more confused than ever! Different means every year the display uses another motif. Not members but priests, of course. Hint - what is the priest`s main role? Where could you see this little exhibition and what was its aim? Is it to do with the Warsaw Uprising? I know daffodils symbolise the hope they had. No, jon, Chemikiem has already established it was a symbolic Jesus` grave at Easter time. Now we are trying to guess why priests put the clocks there. Have a wider view. The beam we talked about isn`t a cross in fact but a big clock. My mistake, sorry..
Now we are trying to guess why priests put the clocks there. To measure the time between the Good Friday liturgy and the first Mass of Easter, symbolising the period when the disciples and His family were still mourning? Sorry, no. Why should anybody measure such time? :) There are more important things. Hint: one of the roles/activities performed by priests to/for people is preaching. Preaching has a few meanings. Which one and how connects with clocks? Last but one hint: Why do people keep/use clocks? To show time. What for???? The Last of the Hints: What is time for people of Western civilisations? Blessing or curse? The Mother of all Hints: How does this and all I said before connect to the death and resurrection of Jesus Christ???? Nope, I can't get this at all. A couple of friends at work had a look today too, and both made the guesses that I previously had. I thought maybe my religious knowledge was lacking, but one friend is an RE teacher, and the other a very religious Catholic, and they were both clueless. Last thought - something to do with all the blessings received over a lifetime? but one friend is an RE teacher, and the other a very religious Catholic, and they were both clueless. Hmm, I am not sure what you mean, probably not. Let`s ellucidate on the whole mysterious clock metaphor then. It is really simple. 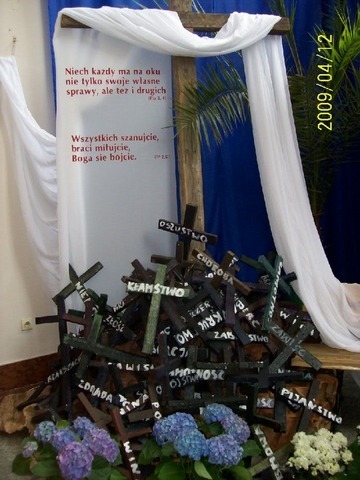 Firstly, one should remember that it has been a long tradition to put up such symbolic grave displays in Polish churches at Easter time. Another thing to remember is that a lot of those displays are meant to get across certain message to believers, often they refer to the times we live in. Every year there is a different display. Also, remember who made this display. what is the priest`s main role?One of the roles/activities performed by priests to/for people is preaching. Preaching has a few meanings. Which one and how connects with clocks? Why do people keep/use clocks? To show time. What for???? What is time for people of Western civilisations? Blessing or curse? How does this and all I said before connect to the death and resurrection of Jesus Christ? Each year the priests in our church build a new decoration for the grave. They do it to preach to the parishoners. Preaching has two meanings: deliver a sermon and instruct/persuade sb to take a course of action. It is natural the display is used to persuade. Who and what about? And why clocks? Clocks are primarily used to show the time. Their secondary function, but the one which often bothers people, is showing the passageof time. We constantly look at our clocks/watches/smartphones and either we are irritated that time goes so slowly or quite the opposite, too fast, depending on a situation. Hence my allusion to the curse of a Westerner - we invented clocks to measure time and we became its and their slaves. Clocks were intentionally chosen by the priests to show the passing time. Time before what? Death, of course. 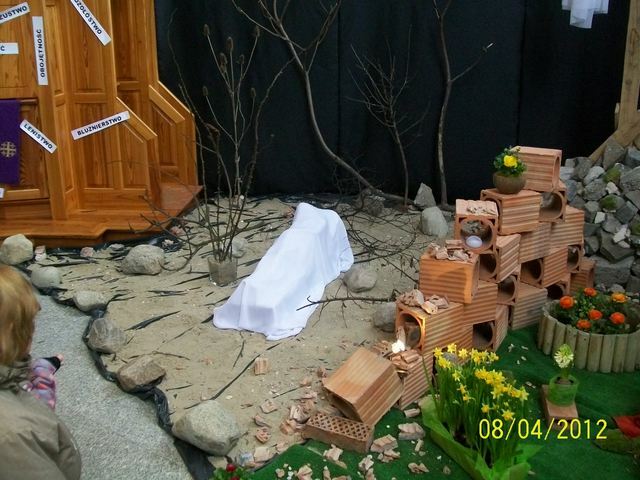 The message is as following: Look at the grave and clocks next to it. Think about how much time you have been left with. It can be actually very little - you can die any moment. What should you do? Give up your sinful ways till you still have a chance, because when time is up and game`s over, it will be too late. Look at the Jesus` grave again, first containing the body, then empty and remember, we are all going to die, but our deeds will decide where we will go - up or down. If you want to go up, try to live like Jesus did. He died, indeed, but thanks to his deeds, he was resurrected and taken to Heaven. If you want to follow him, do as he did - believe, love God and your neighbour, live decently. If necessary, change. your life now before you run out of time. 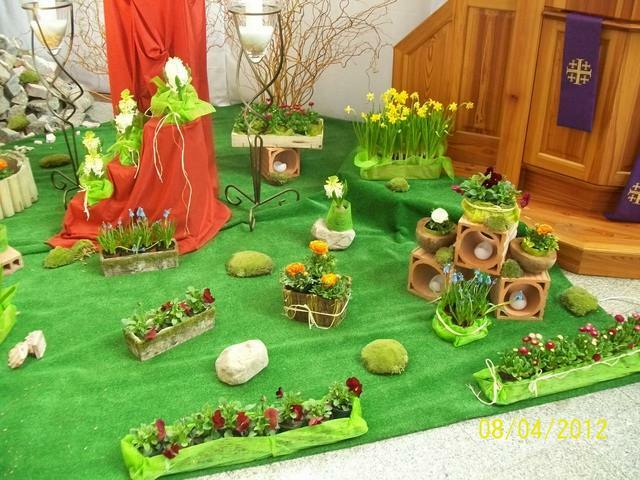 Other educational displays from our church, (I helped to put up some of them and even offered my ideas for decorations but I can`t find the one which used supermarket trolleys full of gadgets, meaning senseless pursuit and devotion to earthly matters) . Let`s move on. Don`t forget about the latest German surnames plaque photo riddle. Don`t forget about the latest German surnames plaque photo riddle. Pawian, those displays are very clever! No, it isn`t so confusing, somebody mentioned this place within the last two weeks. As for being clever - if you mean difficult, no, I have just gone through the first season of riddles (two months) and noticed that members have guessed most of them. So, it is not so bad after all. I am going to sum it up when exactly two months strike, on 11th April. Before summing up, let me remind you there are still a few unsolved riddles: Unfortunately, to avoid repeating the same answers and get some clues, you should read other posters` suggestions as well as my hints. Sorry for bothering you but I just hate leaving things unfinished. German names plaques - what and where? Madonna picture made of what? Burnt dollar notes/bills - where/what for? Two finger signs - why ? Species of fruit - what? Strange penguin - what is going on? Holy place, copy of Lourdes - what/where? What dish is going to be prepared? Oh la la, it has really gotten serious. Clocks were intentionally chosen by the priests to show the passing time. 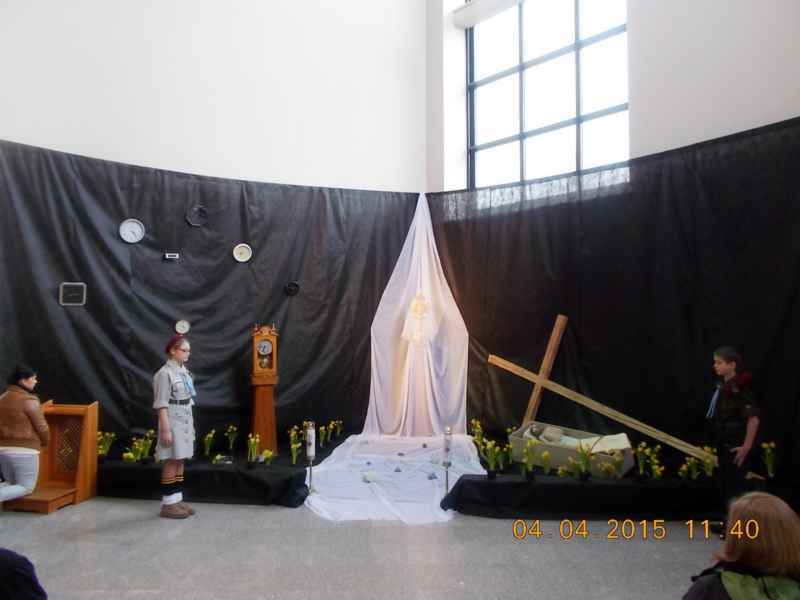 I like the displays btw, especially the one of the sins written on the crosses. I have only been to a Polish church at Xmas, so saw only traditional nativity scenes, nothing like these symbolic ones. I thought I had got the Lourdes one though. Was it not Gietrzwald as I wrote? The two finger signs one was for either Dirk or Ironside to answer. For the dish that was going to be prepared, I listed the ingredients I could see, but I couldn't make out what all of them were. I am pondering over the German names, and that fish statue thingy looks to be in some sort of palace or museum setting? Commemoration of those who died, were massacred. Where? Do you mean location? How the hell would I know? If you mean a place in site or nearby cemetery. Why do you link me with him? He is projecting some American stuff on Poland. Not my cup of tea. b. a pledge to defend constitution (which is useless piece of post-commie ...). By the way they should have just identify all those who are demonstrating - they shouldn't be able to work for a state in any capacity. Ah and if they are former soldiers, security people or the police they should have their pensions taken away from them. What kind of people would destabilize their own country and work against their own legal government inviting and begging for foreign intervention? In a Church, a Leviathan. the baroque. It's not USA, we don't take ppl's pensions away that they worked for their whole life just because we don't like what they do. they shouldn't be able to work for a state in any capacity. Don't be daft. In a democracy, people have the right to express their opinions in any non-violent way they choose. Sad how some turn a thread about interesting photos into a right-wing rant. I have only been to a Polish church at Xmas, so saw only traditional nativity scenes, nothing like these symbolic ones. Nativity scenes are never symbolic, only Easter displays are. 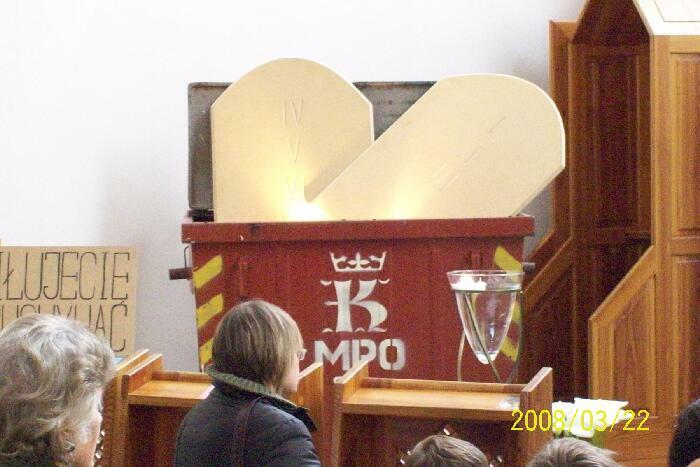 BTW, did you guess the meaning of the first picture which I didn`t describe? I see. But I think I won`t tell you now, let`s wait, someone might join us one day and have a try. No, it is not Gietrzwałd. Will there be prizes after your summing up on April 11th? Yes, the first three best students will be prizes. 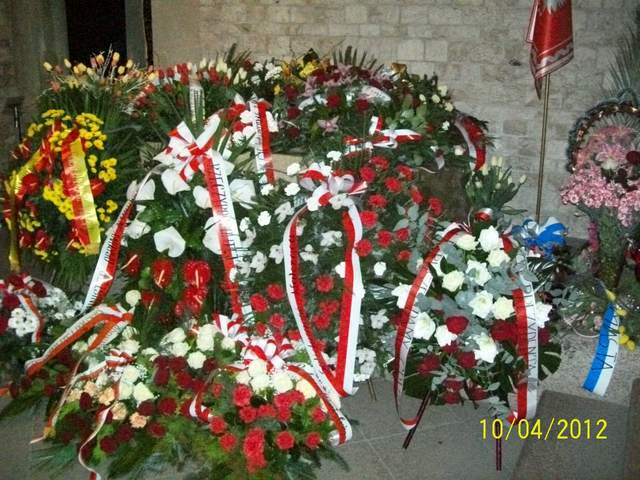 Commemoration of those who died, were massacred. Where? Do you mean location? How the hell would I know? Yes, massacred but it is important when, where and by who. 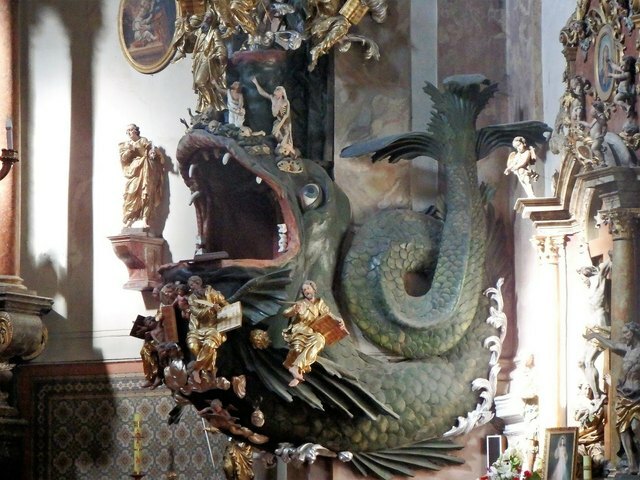 That fish is in a Baroque church indeed, and it is Leviathan (so not a fish anymore). But, what is its function and where is it located? no, they were not German civilians from Wilhelm Gustlof or other ships sunk off the Baltic coast. They died in a place near the south of Poland. Yes, because it is in Silesia region. I won`t tell you which one yet. es, massacred but it is important when, where and by who. As they say the cure is worse than the sickness for the health of the patient. But, what is its function and where is it located? It is a pulpit in St Peter and St Paul Church in lower Silesia. Yes! More exactly, in Duszniki Zdrój. German plaques - Yes, 1945 and Lower Silesia, but not Soviets. No:( I'm not sure what the picture is supposed to represent either, the scene looks to be after an earthquake or something? Or I could be completely wrong again! , the scene looks to be after an earthquake or something? Have a wider view, the first photo shows the right side of the discussed picture. Another riddle in the second photo: what is it?